Imagine the distraught mood in the ukiyo-e print world following the announcement of the Tenpô Reforms (Tenpô no kaikaku). The handiwork of Shogun Ieyoshi's chief senior councilor, Mizuno Tadakuni (1794-1851), the notorious edicts, (named after the Tenpô era, 1830-44, and rolled out gradually from 1841-43 in a final attempt by the Edo regime to right the ailing national economy), included trying to control the spending habits of the merchant class by limiting the size and cost of ukiyo-e. Worse, there was a blanket prohibition against any print that depicted actors or beauties. For Edo-ites, this misguided sumptuary law was vexatious but not a calamity. They had only to turn their attention more fully to landscape, sumô and warrior prints — genres with long, proud traditions in that city. In Osaka, however, a town whose cultural life revolved nearly exclusively around Kabuki, the actor print ban was tantamount to near-total suppression of the single sheet ukiyo-e industry. Or was it? Conventional wisdom says the fear of punishment — a few fines in Edo early on had been horrendously ruinous to the accused, and word of their misfortune had apparently sped down the Tôkaidô — was such that, from mid-1842 to mid-1847, nothing but the odd, thoroughly unprepossessing, non-theatrical sheet emerged from Kamigata print publishing houses. On the other hand, it stands to reason that one or two independently-minded printmakers would have realized that they worked at a fair remove from Tadakuni's grasp. This might explain the existence of a print like Fig. 1, a striking (if unusual-looking) deluxe actor bust portrait executed with a surimono exquisiteness — and datable to 9/1843. Once one has ascertained the decade a print falls in (through artist signature, publisher seal, style, etc) the standard way to date Kabuki prints lacking text is to first identify the actor. Since all Osaka ukiyo-e artists followed the same set of local conventions, this can usually be done from the cut of the jaw, or the angle of the nose or the slant of the eyes. Next, again thanks to conventions, a glance at the costume or make-up or props (here, the bow and helmet) sometimes brings to mind a plausible role. Armed with an actor name and at least a guess at the role, one can then leaf though the extensively archived collection of kabuki theater playbills and ... "Bingo!," arrive at a performance that the print was likely designed to commemorate. It must be remembered that, for a variety of reasons, this method is not infallible. However, according to at least one esteemed Osaka kabuki scholar there exists a very high probability that Fig. 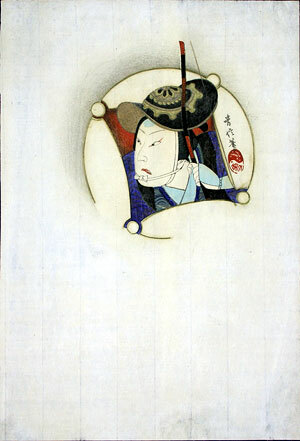 1 depicts Nakamura Utajûrô playing the character Sano Genzaemon in a 9/1843 performance of Yushoku Kamkurayama at Osaka's Kado Theater. In other words, with a date falling well over a year into the start of the actor print ban, this sheet should never have been editioned. News of an Osaka ukiyo-e underground startles, but it should also be pointed out that, if indeed surreptitiously produced, Fig. 1 does not represent an unalloyed act of defiance. For one thing, there is no publisher mark. Had the censors arrived at the door of the printmaker, the tell-tale stack of six or so woodblocks could presumably have been reduced to ashes in an expeditious manner. Further, though the print is signed, the name Yoshinobu, one that appears on fewer than a handful of known designs (curiously all datable to the time of the announcement of the edicts the previous year), perforce belongs to an obscure amateur whom the police might have experienced difficulty even identifying. As for the actor, Utajûrô (possibly pronounced Kajûrô, 1805-48), though an unlikely object of crazy fan behavior — again, one finds him on only a tiny scattering of prints spread out over the entire previous decade — he still could have claimed that the clandestine effort was executed by admirers without his approval. Also worth noting is that, possibly in deference to the spirit of curtailing extravagance with which the edicts were promulgated, less than one-fifth of the ôban-sized paper was utilized to showcase the countenance of Utajûrô — an extraordinary show of restraint for an ukiyo-e.
All these possible signs of meekness notwithstanding, what we have here is a failure to fulfill even the letter of the law. More, the fact that such a print exists at all suggests there were others. Maybe it is time to re-think the question of the effectiveness of the Tenpô print ban, at least in Osaka. This article originally appeared in Daruma, no. 60, Autumn 2008. Copyrighted © text and pictures reprinted with permission.